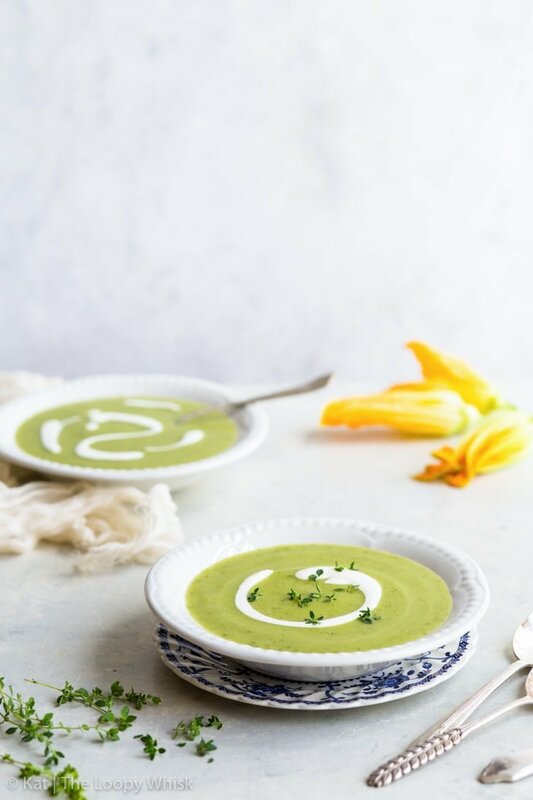 This delicious cream of zucchini soup is is healthy, super easy to make and the perfect quick summer lunch! 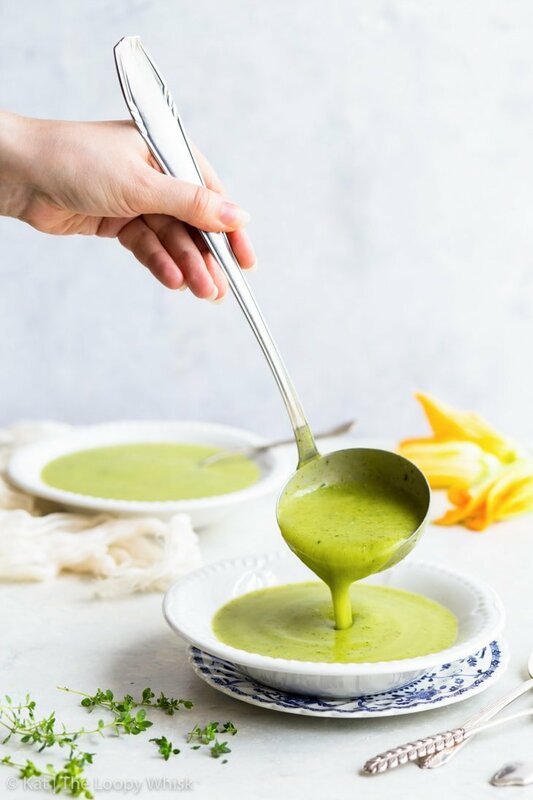 And while this soup is both vegan and paleo, don’t let that fool you – this healthy zucchini soup is filling and immensely satisfying. 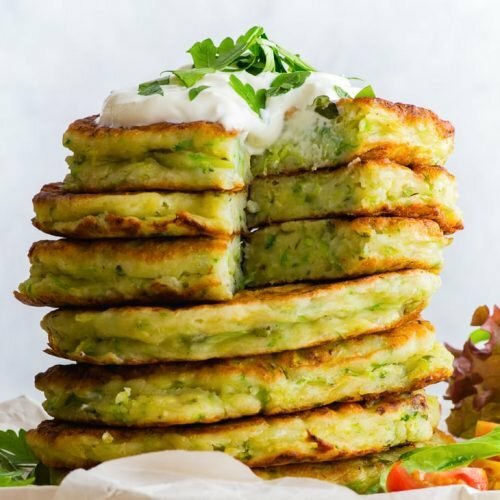 Are you tired of zucchini yet? Just kidding! We all know there is no such thing as too much zucchini. What a preposterous thought! 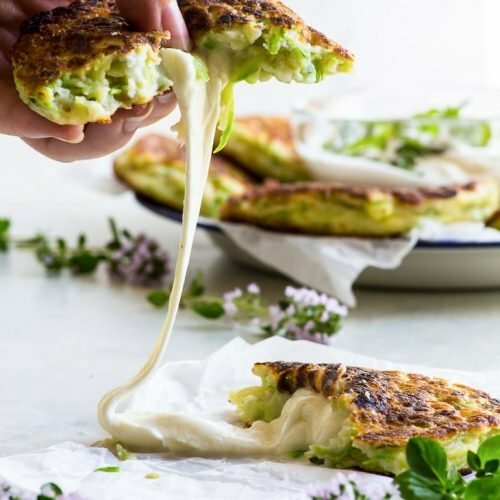 So, we’ve talked about zucchini fritters and their cheesy upgrade of mozzarella stuffed zucchini fritters. There was also the flaky perfection of the gluten free zucchini galette… ah, good times. 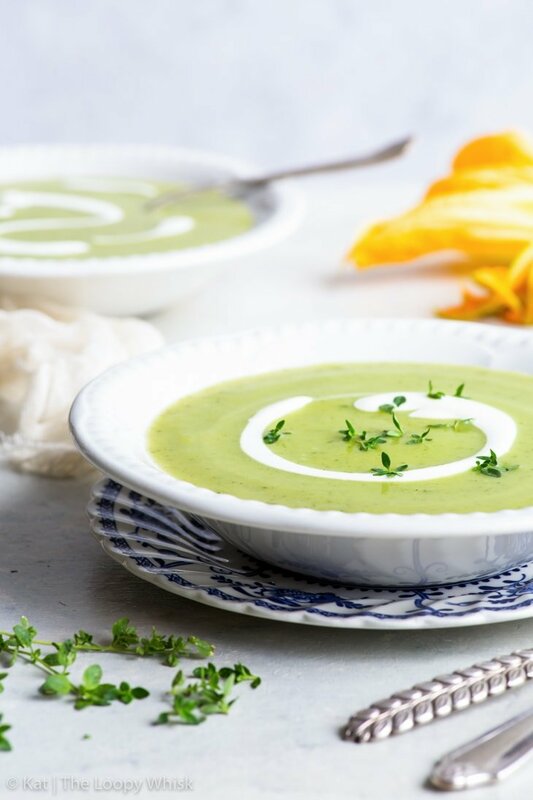 Today, we’re going in the other direction: still savoury, still delicious and just about the perfect comfort food meal: cream of zucchini soup. 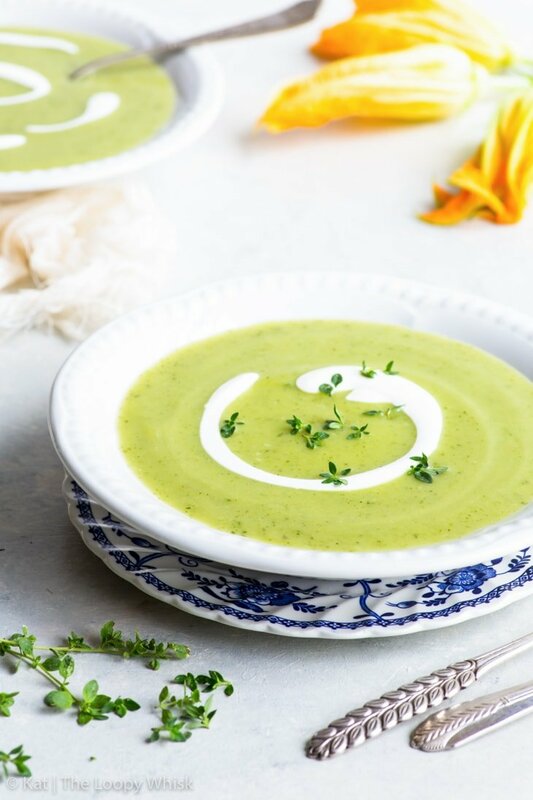 Now, before you start getting all outraged about a soup recipe in the middle of the most terrible heat wave ever – this zucchini soup is just as AMAZING when cold. So don’t stress. You’ll love it. Mmkay? 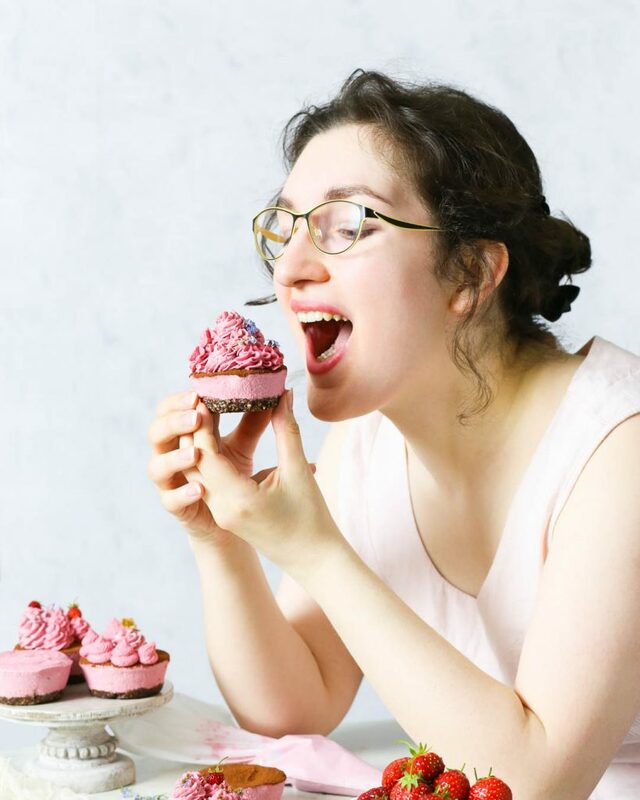 SO… HOW DOES IT TASTE? I was a bit sceptical about zucchini soup, if we’re being completely honest. I don’t have exactly fond memories of zucchini in soups… they go all soft and mushy and ugh. But this cream of zucchini soup doesn’t have any chunks in it, being pureed into creamy oblivion… so I though to myself – might as well give it a try, right? And oh em gee am I glad I didn’t give up on in without even trying. Sheer creamy perfection. 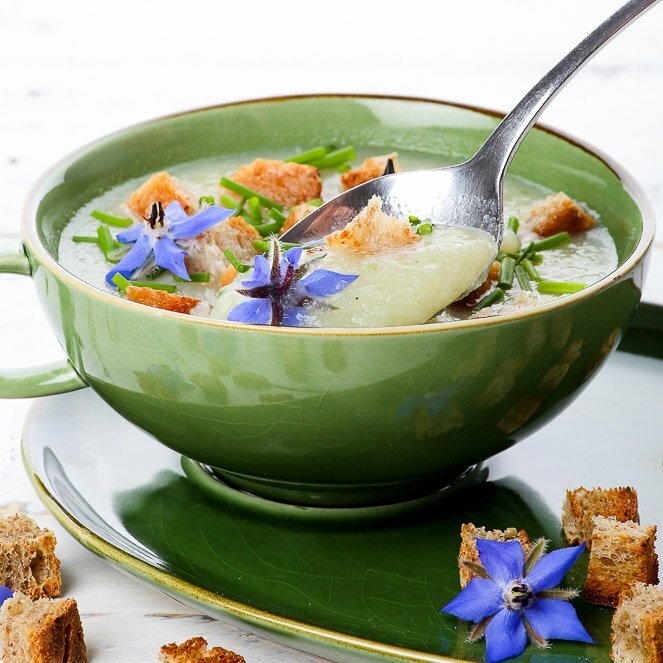 The cooked and blended zucchini transforms into this luscious, almost decadent soup, without the addition of any cream! Truly amazing. And not difficult to make at all! 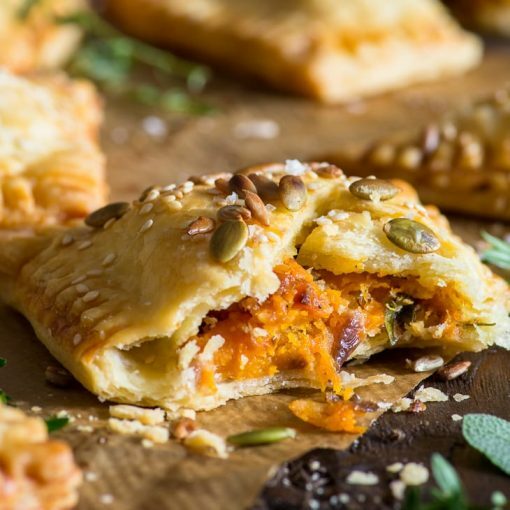 Plus, it’s healthy – naturally gluten and dairy free, as well as vegan and paleo. But don’t let that deceive you: this zucchini soup is filling and immensely satisfying. Of course, it all starts with a small mountain of chopped zucchini and water. 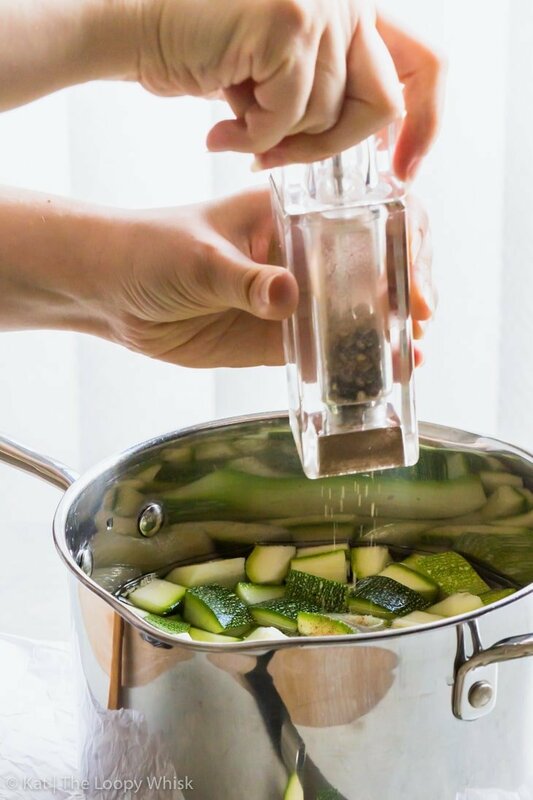 A pinch of salt and pepper for the taste… and then we’ll let it all simmer away until the zucchini are buttery soft and the cooking water has the most beautiful aroma. Just be sure not to burn the garlic – it will get all bitter and icky. 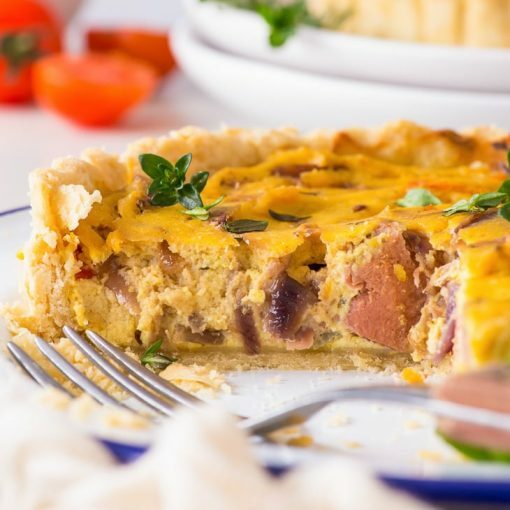 Get it to the light golden brown stage, and you’ll get the best flavour out of it. 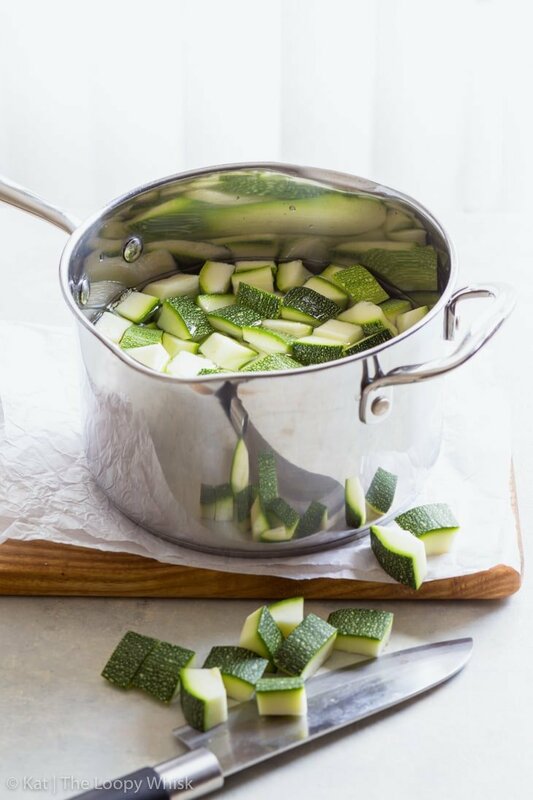 Once the zucchini are cooked, we’ll plop in the garlic+thyme and blend it all into vibrant green creamy perfection. Add a bit more salt and pepper if needed, and don’t forget to taste test! I mean it, I hate when you see cooking/baking shows and nobody tastes anything. Peeps, taste your food as you cook. It’s the one thing that will increase the probability of an excellent meal by about 1,000%. This cream of zucchini soup is excellent both hot (or warm, no one likes a burned tongue) and chilled. Because, yes, the weather has been boiling hot, and the idea of a hot soup is not the most appealing at the moment. I get it. The soup is best served with a dollop of yogurt – you can use a non-dairy one with a squeeze of lemon juice if the yogurt isn’t acidic enough on its own. Because it’s that zing of acid with the creamy zucchini soup that makes this dish truly sing. 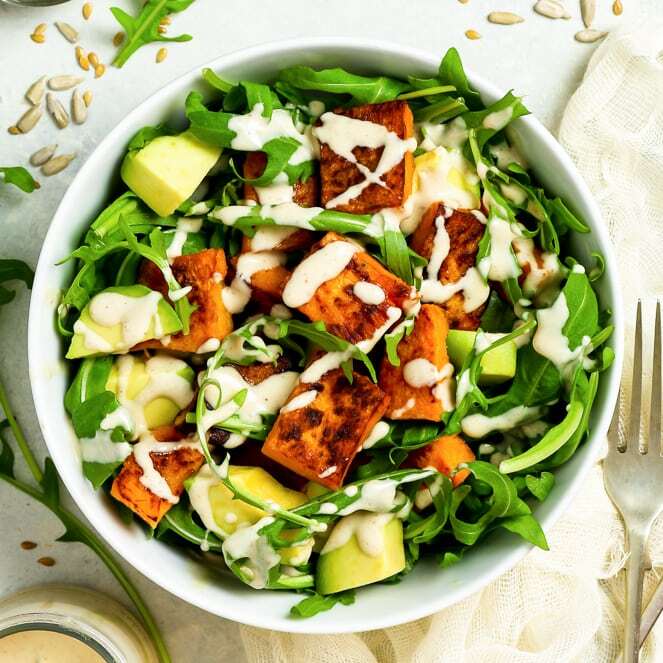 Add a sprinkling of thyme… and you’ve got yourself an easy and healthy summer lunch that will have you craving more. Add the chopped zucchini and the water to a pot, and season with salt and pepper. Bring to a simmer and cook for about 1/2 hour, or until the zucchini are soft. 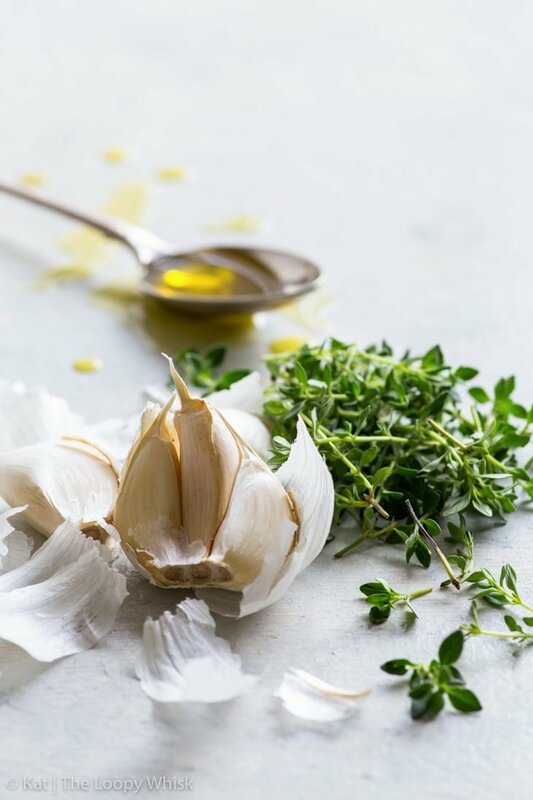 In the mean time, fry the chopped garlic and thyme in the olive oil, making sure the garlic doesn't burn – remove from heat when the garlic is light golden brown. 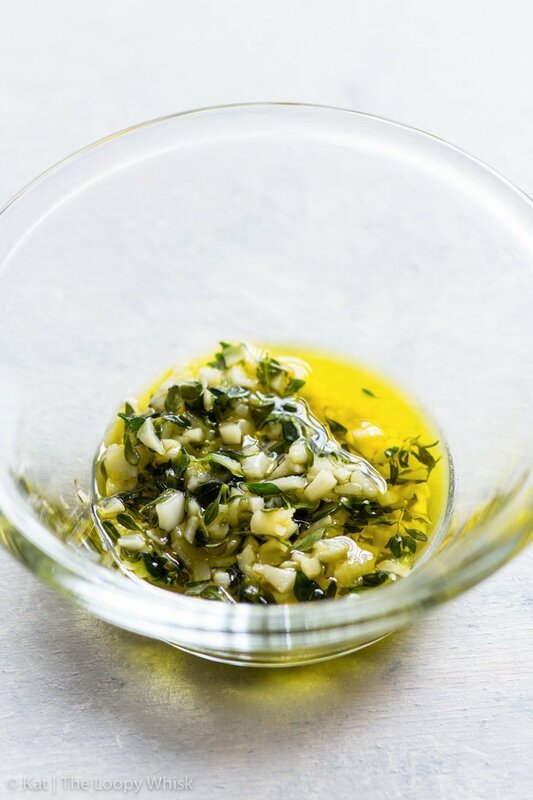 Once the zucchini are soft, add the garlic, thyme and olive oil, and blend (in a blender, food processor, or using a hand blender) until smooth and creamy. 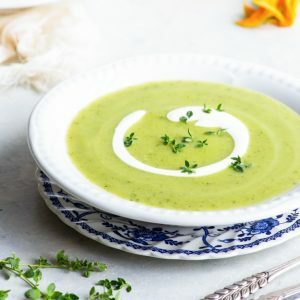 This healthy zucchini soup is delicious both hot and cold, served with a dollop of (non-dairy) yogurt and a sprinkling of thyme. 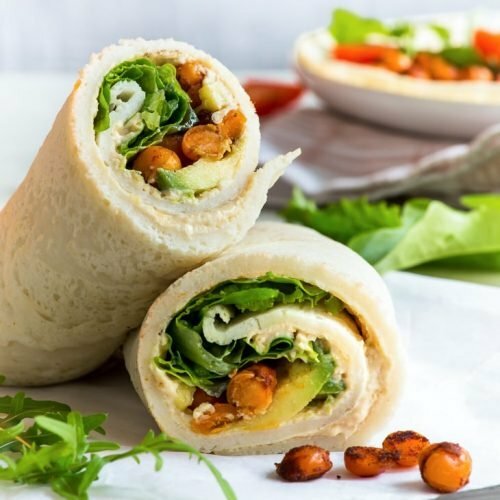 Looking for more quick & easy lunch recipes? Previous post Welcome to the New + Improved The Loopy Whisk!